Not the usual type of story I often cover. So I pack the Mark IV and a couple lenses into my Domke F-2 and hop on the plane bound for Kitakyushu in Fukuoka Prefecture. On assignment once again with Richard Lloyd Parry, Asia Editor of The Times of London. Really, I gotta thank a shooter friend of mine whose work inspires me, Jeremy Sutton-Hibbert, for passing me a lot of jobs after leaving Japan. Out of all the other photogs out here in Tokyo, I was chosen and I'm more than grateful for that. Check out his blog here. 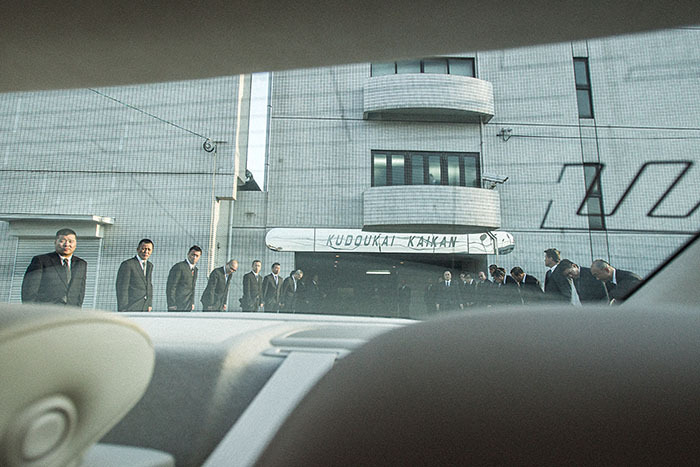 I really didn't know much about these yakuza groups at the time but I was told that the Kyushu region is noted to be among the largest source of yakuza members in Japan, and that one group referred to as the Kudokai were expecting us. Not to meet in a public restaurant, coffee shop or hostess club, but into their four-story headquarters. I think that it may be only in Japan where these types of groups have legitimate offices and business cards to hand out. This one is our warm welcoming to the Kudokai fortress consisting of high walls, barbed wire and security cameras all around. I have doubts that it's open to the general public. In this scene I kinda felt like a president for a minute as we made our way in, the guys to the left and right all bowed to show a sign of respect. A scene you just don't see everyday that I had to take a photo of it. Of course, asking the Kudokai's PR person for permission first. They prepared some delicious treats for us. Coffee and cake. The man in the center is Hiroshi Kimura. One of the Kudokai's senior executive members on the board. As a photographer out in the field where you can't always exactly control the environment, over time I learned a lot about how the way people move which enables me to better predict how I could capture that reaction shot best illustrating the individuals character from my perspective. I'm not perfect at it still, but I've gotten a lot better. Situated in one of their rooms is a religious altar where Kudokai members regularly pay their respects to members that have moved on into another life. I thought this scene was pretty gangster to get Hiroshi pose for a picture with their Kudokai flag and that real samurai armor you see in the background. Pretty cool stuff if you ask me. For some reason I was kindly asked to be in a separate car by myself a part from The Times staffers. The drive back to the train station where we all eventually made it back to Tokyo with an entire experience to remember.